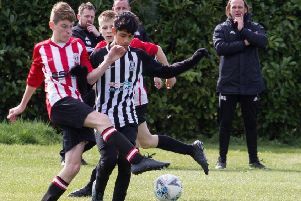 Melton Town’s title hopes took a big dent as their 17-match winning run came to a halt in their big clash at Anstey Nomads on Tuesday. Town were second best in every department and must now concentrate on winning their five remaining games while hoping Nomads and Lutterworth come unstuck, twice. Melton had last dropped league points more than four months ago as they headed to second-placed Anstey, the only opponents to have denied Town a goal this season. Expecting a tough test of their progress this season, Melton came out of the traps with all guns blazing and played some fast football which had the hosts on the back foot. Only three minutes had been registered when Michael Reeve’s floated cross had Nathan Arnold volleying just over the bar. The next attack had the Anstey defence at sixes and sevens with Arnold and co-manager Jon Stevenson combining, but the final ball to Reeve was cut out brilliantly by Wolff. A free-kick in a central position was scuffed wide by Hicks as Anstey tried to respond, but the match had a nervous edge to it, with neither side creating any chances. But then a mad two minutes decided the game. First Chitiza lined up a free-kick on the left, and from 25 yards out he sent in a powerful shot which beat goalkeeper Rob Peet and found the corner of the net after 20 minutes. And from the next attack, Matwasa got the better of the Melton defence and fired in a cross which found Armeni. He touched it aback to Hopewell who made no mistake, smashing a shot past Peet for 2-0. On the half-hour mark, Hammond was played through and turned Preston, but the defender managed to block the shot as he pulled the trigger. The ball fell to Jordan Lever whose shot went an inch past the post. Two minutes into the second half Arnold tried his luck from a free-kick out wide which had Smith tipping over. Arnold then played a corner into the box where Leon Fray had time to line up a header which was cleared by Dawson under his own bar. The only other chances of any note came when Hicks’ 20-yard shot landed on the roof of the net, and minutes later Arnold went clear of the defence only to see his low shot well blocked. Melton continued to play attacking football, but on this occasion came up against a resolute defence. The result left Melton four points behind Division One leaders Lutterworth, whom Town visit on April 13, and three points behind Anstey, with both rivals having much superior goal differences. Next up for Town is a tough away game at Irchester before their long-awaited Senior County Cup final next Tuesday at Holmes Park, Leicester (kick-off 7pm). Town: Peet, Rigby, Levi Fray, Stevenson, Wilson, Leon Fray, Arnold, Hill, Reeve, Hammond (Storey), Lever (Gilchrist).